The New AutoCreaser Pro 385 is an easy to use automatic paper creasing machine with a deep pile feeder for digital printers, which allows the user to employing a unique creasing rule that eliminates paper tearing and therefore cracking. The AutoCreaser Pro 385 is equipped with the very latest in technology to enable automatic set up of jobs, including setting of all feeder functions, by selecting just a few simple parameters on the MorganaSmartScreen touch screen control. The new deep pile feeder allows stacking of up to 17.72″ of paper to enable longer runs and is equipped with a SmartStep table drop for fast loading of shorter run jobs. Paper feeding is controlled by a new vacuum top feeding drum that can automatically change between a wide range of paper types and thickness with little operator intervention. 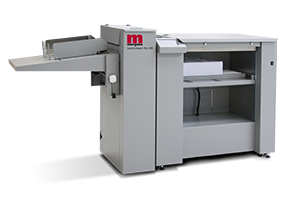 The AutoCreaser Pro 385 provides the complete solution to the problem of cracking that occurs when folding digitally printed output. It is equally effective in dealing with conventionally printed card, laminates or cross-grained stock.